Speaker notes: Putting notes to yourself in the Notes section of either Notes Page view or Normal view is a good way to add reminders about topics that you want to talk about, but don’t want to clutter your slides with. You can display notes as the presentation is running using Presenter view, but the notes aren’t visible to your audience. Notes: The Notes Page view is a place to put all that extra text that you want to put onto your slides and read to your audience, but you wisely choose not to abuse your audience that way. Plus you can rearrange the layout of Notes Page view. 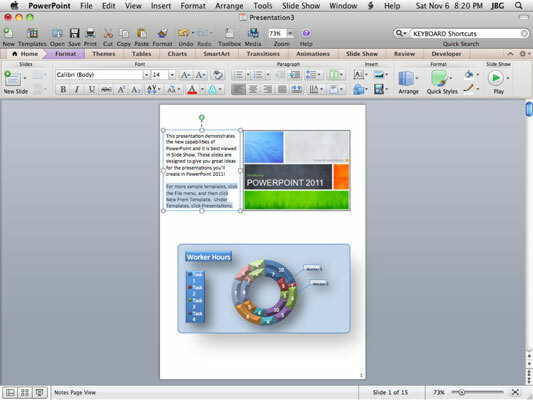 When you choose to distribute your presentation, in the Print dialog you can choose Notes under Print What and then choose PDF to make a version to print or share. Documentation and annotation: It’s always advisable to cite your sources. Put hyperlinks and citations into your notes to keep your slides clutter-free, yet have the information immediately available. Supplemental content: You can put more than just text into Notes. Other objects work just as well, and you can format just about everything. Supplemental material is visible only in Notes Page view, and is not seen in Normal view. You can drag the placeholders in Notes Page view to rearrange and resize them. You can use the Notes Master to make a custom Notes layout for your entire presentation.